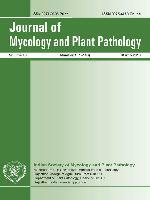 The Journal of Mycology and Plant Pathology , published by the Indian Society of Mycology and Plant Pathology, includes original research articles on fundamental and applied pathology involving fungi, bacteria, viruses, mycoplasmas, nematodes, other parasites and nutritional imbalances. It is published thrice a year in April, August and December. The National Academy of Agricultural Sciences (NAAS), had rated this journal with a mark of 5.79 (effective from 01-Jan-2017).